Who doesn't love pizza? It makes me a little sad that pizza often gets such a bad rep as being a typical 'junk food meal' - but it totally doesn't have to be that way! Any meal (especially pizza!) can be made 100% healthy, wholesome, nourishing and still super delicious, just by switching up the ingredients and getting a little creative. 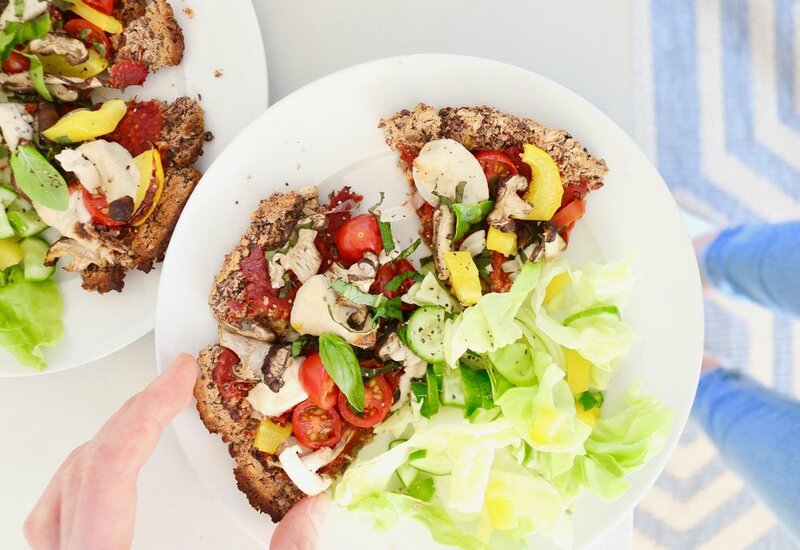 The other great thing about this pizza base, apart from tasting great and being packed with fibre, plant protein, calcium, B vitamins, iron, zinc and more, is that it's the ultimate CHEAT'S pizza base - minimal ingredients and takes just a few minutes to make. No kneading, no waiting for the dough to rise, no mess, just instant pizza goodness. As it's full of both fibre and protein, as well as slow-releasing complex carbs, this pizza is super satisfying and filling, giving you long lasting energy without the typical slump after eating. The base holds together surprisingly well (although it is a little more crumbly than your regular dough base! ), and the edges are crisp and crunchy. YUM. I'm calling this the Mediterranean Pizza not only because the ingredients are all typical to that region of the world (think beans, tomato, basil, garlic, Italian herbs, capsicum, onion, mushrooms...), but because legumes - the star ingredient of this pizza - is one of the commonly eaten food groups that make the Mediterranean diet so health-promoting, making the Mediterraneans one of the world's Blue Zones, home to the longest living and healthiest populations! Load up your bean base with all of your favourite veggie toppings, a good slather of tomato sauce and fresh herbs like basil and oregano are a must, For that savoury, cheesy flavour, add some nutritional yeast, vegan parmesan or cashew cheese. And there you have yourself a delicious and nutritious Mediterranean-inspired pizza! 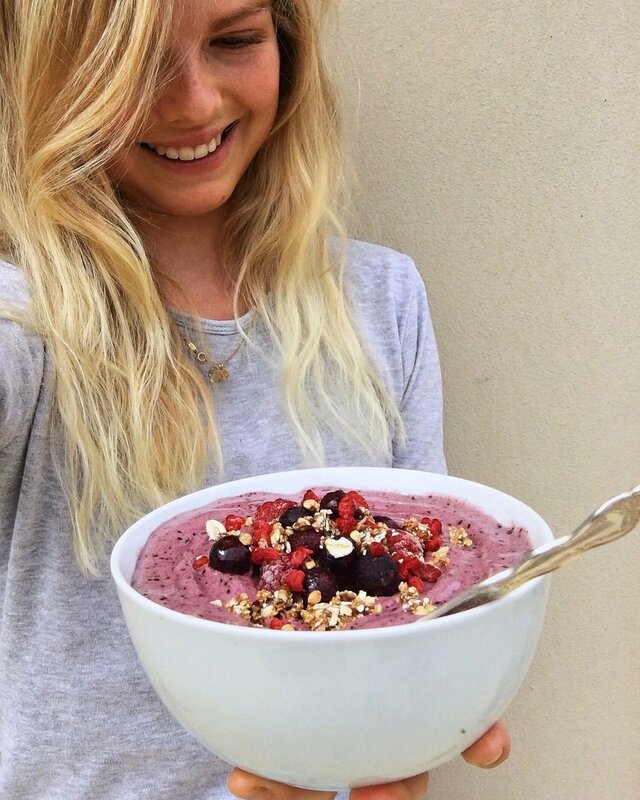 Be sure to tag me on Instagram if you try this recipe out, I love seeing your delicious creations! Toppings of your choice - some of my favourites are tomato sauce as a base, with spring onion, capsicum, tomato, mushrooms, cashew cheese, and fresh basil of course! Preheat oven to 220 degrees Celsius and line a tray with baking paper. In a blender or food processor, puree the beans, garlic, Italian herbs and psyllium husk, then spread bean mix in a circular shape on the baking paper (about 0.5cm thick) to form the base. Bake in the oven for 10 minutes until firm and golden, then gently slice a knife or spatula underneath to loosen the base from the baking paper and flip over. Bake for another 5 minutes. Remove base from oven again and spread with tomato paste, then layer on all your toppings of choice! Bake for another 10 minutes until golden on top. Top with fresh basil, slice and enjoy! Psyllium husk helps to hold the base together so it doesn't crumble as much. If you don't have psyllium husk you could also use flaxseed meal or chickpea flour!